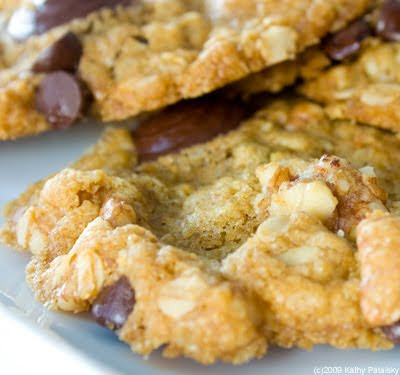 Mint UFO Chewy Chocolate Chip Oatmeal Cookies. 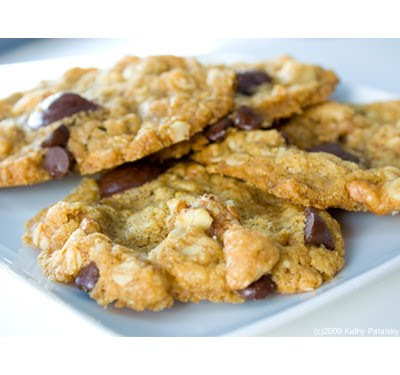 Great Aunt Bea's Chewy Mint Chocolate Chip Cookies. This recipe is a variation from the one my amazing Great Aunt Bea taught my sister and I, when we were around 9 (me) and 12 (sis) years-old. I remember it was a dark and stormy night. (Cue loud thunder crack) A summer thunderstorm turned the sky dark gray and lightening was striking the desperate purple clouds. Screeching wind was knocking trees against the windows in every shadow-filled room. Luckily, Great Aunt Bea had a knockout recipe up her sleeve. And mint chocolate chips in her cupboard. optional: 3 Tbsp flax seed meal. (Nutritionally enhances the recipe. Flavor is only minutely impacted. 1. Combine all the dry ingredients in a bowl: flour, sugar, oatmeal, salt, baking soda, and flax seed meal (opt'l). Mix/sift well. 2. Stir in all the liquid ingredients: soy milk, canola oil, vanilla extract. If dough seems dry add in a bit more soy milk. Dough should seem a bit 'wet' since you still have to fold in a lot of add-ins. 3. Fold in the chocolate chips and mint chip chunks. Fold in the chopped walnuts. It's OK if the dough seems really 'chunky'. It might be a bit tricky to spoon onto your pan, but the taste will be well worth it! 4. 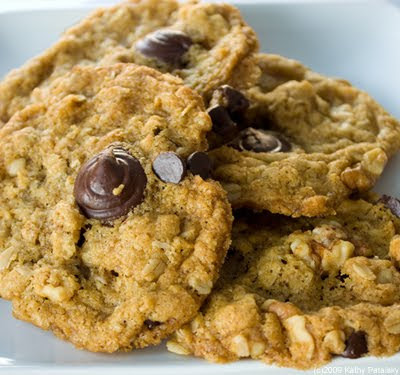 Spoon Cookie dough onto a lightly sprayed cookie baking sheet or parchment paper lined sheet. 5. Dot each cookie with a mint UFO on top. 6. Bake at 350 degrees for 11 minutes. Cookies will continue to harden after they are removed from oven. Extra large cookies may need a few extra minutes. *You may adjust the amount of canola oil you prefer. 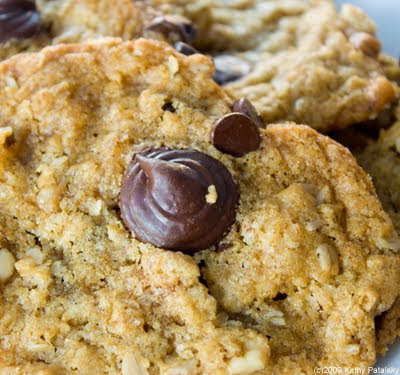 Use more for a super decadent chewy-crispy cookie, use less for a lower calorie cakier cookie. *You can easily substitute a vegan white sugar for the raw turbinado, however try and use half white and half of a 'brown colored' sugar. 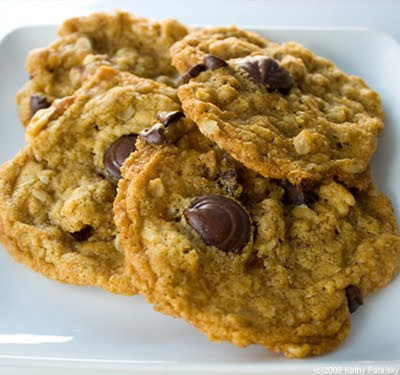 The brown raw sugar adds a caramelized flavor that white sugar simply cannot match. 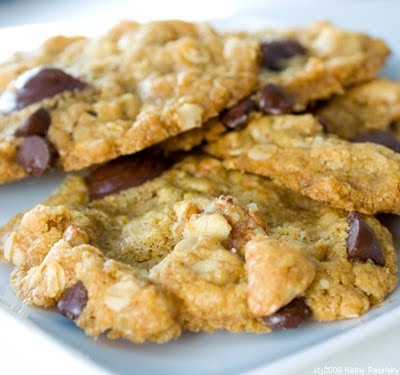 *Add More: Honestly, I love a chunky chewy cookie, and if you want to go extreme on the chunkiness, add in a bit more oatmeal, a bit more walnuts and even a tad more sugar to balance out the added chunks. An additional pinch of salt would be a good idea too.